Club members Chris Hill and Jaime Rosier won the Capri 14.2 class at the ABYC’s Boxing Day Race aboard their boat, “Team Damage Boy.” Chris and Jaime overcame a late start and fought back from 4th place to take the Capri victory, finishing 41st overall out of 63 boats. Meanwhile, Dennis Trombley and Carol Lyon entered a Shields in the race and took 25th place. The annual “pursuit” race was held on December 26th, 2015. The event gives slower boats (such as Sabots and Capris) a time-measured head start over faster boats (such as Shields, Lidos and Lasers). A Viper 640 won the overall race this year. Check out the full gallery of photos on our Facebook page, here. 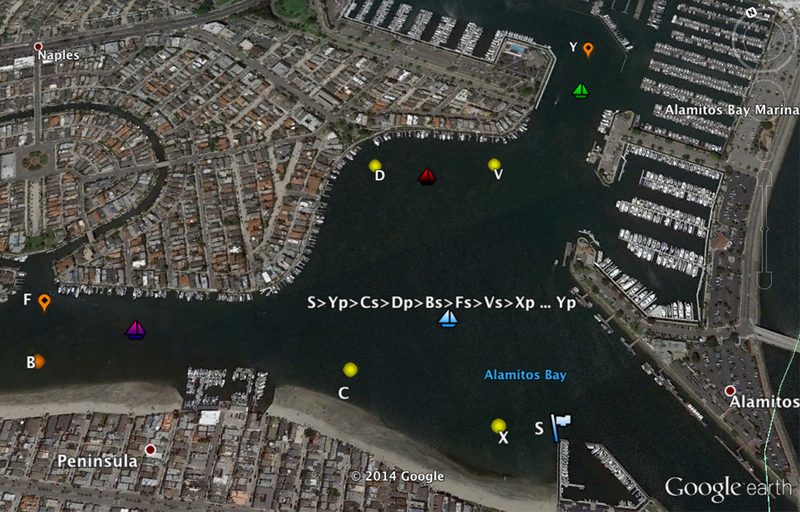 A steady South-Southwest wind of about 7-8 mph allowed the boats to move fairly quickly around the course, which zig-zagged across Alamitos Bay: S>Yp>Cs>Dp>Bs>Fs>Vs>Xp (p=port rounding; s=starboard rounding). Check out the course map here. Isabelle, skippered by Dennis and crewed by Carol, was the lone Shields to enter the 63-boat field. Team Izzy had one of the latest start times in the race — 2:01 pm, almost an hour behind the race’s Sabot classes (1:05 pm start). Despite the handicapped start, Dennis and Carol were able to overtake roughly 25 boats (including the four Capri 14s) and finished 25th overall. It was the first time a club Shields entered the race in almost 10 years. The Capri 14s had a 1:47 pm start, 42 minutes behind the first group of Naples Sabots and only three minutes ahead of the Lido 14 (B) group. Capri #5 (“The S.S. Dirtbag”) skippered by Mike Fratantoro and Estela Tejidor, got a clean start off the line and took the opening lead but were soon caught by Capri #6 (“Argentina Fullerton”) skippered by Abel Olivieri and Laurel Skinner, and Capri #7 (“Serenity”) skippered by Kyle Henneberque and Diana Park. All three boats were side-by-side heading into the first mark at Long Beach Yacht Club. Rounding mark-Y first though were Kyle/Diana in Capri 7 after a strong move inside before the mark. The lead was short-lived though, as Abel/Laurel took over on the upwind beat in the LBYC channel. Midway to mark-C, though, Estela/Mike on Capri 5 took back the lead and held it for the next hour. Later on the first lap, Kyle/Diana were able to pass Abel/Laurel and they finished 3rd and 4th, respectively. Meanwhile, after a late start, skipper Chris Hill and Jaime Rosier on Capri #4 got rolling and started picking up the Capris one-by-one. By time they reached the second lap Chris/Jaime were only a minute behind Capri 5 and finally overtook Estela/Mike between marks D and B. Despite a late charge by Capri 5 at the end of lap 2 that brought the boats only feet apart, Chris/Jaime held the lead and later crossed the finish line near LBYC a minute in front. Shields Fleet 20 will enter the Southern California Yacht Association’s MidWinter Regatta on February 20th and 21st, 2016 and sail in the PHRF classes hosted by Seal Beach Yacht Club.